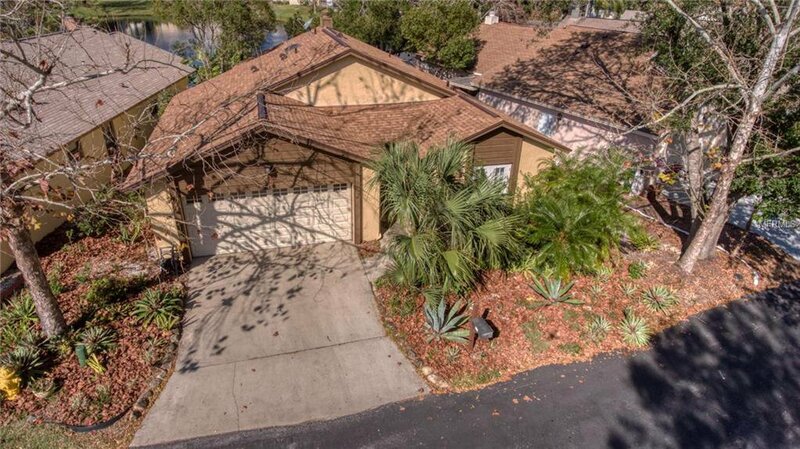 Beautifully updated 3 bedroom, 2 bath home in the community of Wedgewood Tennis Villas! Located across the street from Tuscawilla Golf & Country Club! Low monthly HOA fee includes lawn maintenance. Home features split floor plan for added privacy, a 2-car garage, vaulted ceilings with exposed beams, a cozy and fireplace in the living room, and laminate wood and tile floors. Floor plan is open and bright! Kitchen totally updated with soft close drawers and solid top. Front bedroom features a nice, private patio area. Huge Middle Bedroom includes Murphy Bed. NEW ROOF 2018, UPDATED PLUMBING a move in treasure with great views of Pond from Gorgeous PORCH. Community features include private tennis courts and a clubhouse. Conveniently located near major highways, A rated Winter Springs schools, walking & biking trails, shopping, dining, and entertainment! Don’t miss your opportunity to live in this wonderful Country Club community! Listing courtesy of RE/MAX TOWN & COUNTRY REALTY. Selling Office: RE/MAX TOWN & COUNTRY REALTY.